ReadySuite 6.0.5 is released and now available to download. We recommend all customers using previous versions update to this release to benefit from new scripts, performance improvements, and increased stability. In this release, ReadySuite is now compatible with RelativityOne, allowing you to leverage ReadySuite to load data directly into your Relativity workspaces. This extends on our existing compatibility with Relativity versions 9.4, 9.5 and 9.6. We’ve added several new scripts (shown below) – bringing our script library to over 40 scripts now for managing your eDiscovery workflows. To see a full list of changes in ReadySuite v6.0.5, release notes can be found here. 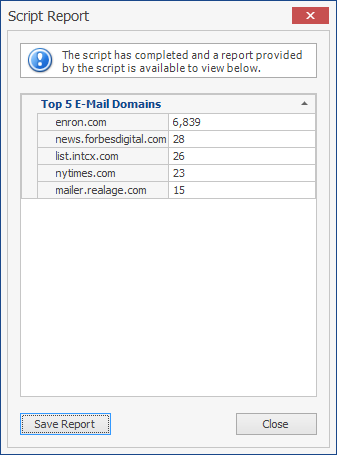 Use this script to count and report on the top number of e-mail domains in your load file. You can specify 1 or more e-mail fields: From, To, CC, BCC and choose the number of domains to report on. Use this script to extract the e-mail address portion of an e-mail field into a separate field. Use this script to extract the display name portion of an e-mail address field into its own field. Use this script to populate attachment/child data to the parent document with a delimiter. See script in action below re-creating an “Attachment Filename” field on an e-mail record. Use this script to import documents from single page image files with a CSV file containing a BEGDOC and PGCOUNT field. The script has options to specify a parent folder containing single page image files. A second option for specifying the CSV file with a BEGDOC and PAGE COUNT field. The script will create document breaks by looking for files named after the bates number. Use this script to count the number of e-mail recipients in the To, CC or BCC fields. You can choose any or all fields to report the total number of recipients.